THE WAY FORWARD: “Many opportunities await to strategically position [Jamaica] as the regional hub for natural gas,” Minister Wheatley noted as he addressed Wednesday's opening ceremony. 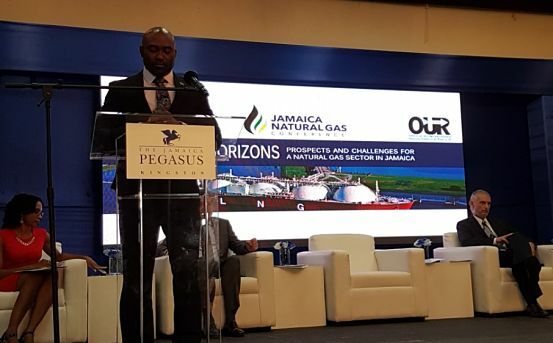 AS the Government increasingly looks to natural gas as an alternative that can significantly boost the local energy sector, the first-ever Jamaica Natural Gas Conference opened with much aplomb at the Jamaica Pegasus Hotel in New Kingston on Wednesday morning. Observing the theme “New Horizons: Prospects and Challenges for a Natural Gas Sector in Jamaica,” the inaugural conference will take place over three days, bringing together industry stakeholders, local and international experts and government officials to discuss strategies for implementation and plot the way forward. For his part, Dr. Andrew Wheatley, who has portfolio responsibility for the energy sector, informed the gathering that plans are well advanced for the JPS Bogue Plant in Montego Bay (and another plant located in Old Harbour Bay, St. Catherine) to take advantage of natural gas opportunities, thanks in large part to international partners and LNG specialists New Fortress Energy. In fact, a scheduled field-trip tour of the Bogue sites will bring the curtains down on the conference on Friday. Ahead of Friday’s trip to Montego Bay, the conference continues on Thursday’s Day Two with a number of sessions centred on business opportunities and the long-term benefits of natural gas, including the reduction of Jamaica’s carbon footprint.